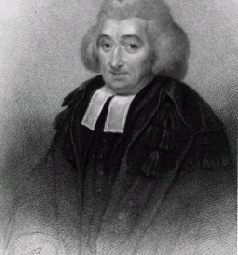 CAMPBELL, DR GEORGE, an eminent theological writer, was born on Christmas day, 1719. His father was the Rev. Colin Campbell, one of the ministers of Aberdeen; a man whose simplicity and integrity of character were well known throughout the country, and the cause of his being held in general esteem. While the theological sentiments of this respectable person were perfectly orthodox, his style of preaching was very peculiar: it no doubt partook of the fashion of the times, but he seems to have also had a singular taste of his own. Dr Campbell frequently spoke of his father; and though his connection with so excellent a man afforded him great pleasure, he sometimes amused himself and his friends by repeating anecdotes respecting the oddity of his conceits in preaching. He delighted much in making the heads and particulars of his discourses begin with the same letter of the alphabet. Some very curious examples were in the possession of his son, which he related with great good humour, and which no one enjoyed more than himself. He had followed the fortunes, and adhered to the principles of the Argyle family. He was therefore a decided whig, and was very active in promoting, in 1715, among his parishioners, the cause of the Hanoverian succession, and in opposing the powerful interest of the numerous tory families in Aberdeen. This worthy man died suddenly, on the 27th of August, 1728, leaving a widow, with three sons and three daughters. The subject of this memoir was the youngest of the sons. The grammar school of Aberdeen has long maintained a high rank among the Scottish seminaries; and it now enjoyed more than its usual reputation from the connection of Mr Alexander Malcolm, the author of by far the most extensive and philosophical system of arithmetic in the English language, besides an excellent treatise on Music. Such a man produces a strong sensation, wherever the sphere of his exertions happens to be, but in a provincial town like Aberdeen, where almost all the youth are his pupils, the impression he makes is naturally much greater. George Campbell, though said to have been a lively and idle, rather than a studious boy, made a respectable appearance in this school. He was afterwards enrolled a member of Marischal college, and went through the Common course. A senior brother, whose name was Colin, had been devoted to the church, and George therefore proposed to study law. He was bound apprentice to Mr Stronach, W. S., Edinburgh, and regularly served the stipulated time. But he does not seem to have entered upon this line of life with any ardour. Before he had finished his apprenticeship, his resolutions were fixed for another profession, and, in 1741, he attended the prelections of professor Goldie, who then held the theological chair in the Edinburgh university. The celebrated Dr Blair began, about this time, as minister of the Canongate, to attract public attention by his discourses; and Campbell became a devoted admirer of the style of that great divine, with whom he, at the same time, formed an intimate personal friendship. At the conclusion of his apprenticeship, Mr Campbell returned to Aberdeen, and concluded his education as a clergyman in the divinity halls of that university. His superior intellect was now marked among his fellows, and he became the leader of a disputing society which was instituted by them in 1742, under the name of the Theological Club. Being licensed in 1746, he soon attracted attention by his discourses; yet in 1747, he was an unsuccessful candidate for the church of Fordoun, in the Mearns. When his reputation had acquired more consistency, he was presented to the church of Banchory Ternan, a few miles from Aberdeen, under circumstances of a somewhat extraordinary nature. Neither the patron nor those who recommended Campbell, were aware of his Christian name. It therefore happened that Colin, his elder brother, a man of great worth, but comparatively slender abilities, was applied to, and invited to preach at Banchory, as a prelude to his obtaining the living. Colin’s public exhibitions did not equal the expectations which had been formed; and, in the course of conversation, the sagacity of the patron, Sir Alexander Burnett, discovered that it was his brother whose recommendations had been so ample. George Campbell was afterwards invited, and the satisfaction which he gave insured success, for he was ordained minister of that parish, June 2, 1746. He was not long in this situation when he married a young lady of the name of Farquharson. Though Mr Campbell did not, at this early period of his life, give token of that power of intense application which he manifested in his later years, it is supposed that he formed, in the solitude of Banchory, the original ideas of all his great works. He here composed the most important parts of his Philosophy of Rhetoric. This admirable and truly classical work, in which the laws of elegant composition and just criticism are laid down with singular taste and perspicuity, originally formed a series of detached essays, and contains, with a few exceptions, the outlines of all the works he ever published. At this time also he began his great work, the Translation of the Gospels; [When Mr Alexander Fraser Tytler (afterwards Lord Woodhouselee) published his "Essay on the Principles of Translation," a correspondence ensued betwixt him and Dr Campbell, in consequence of the latter asserting that many of the ideas contained in the Essay had been appropriated without acknowledgment from his "Translation of the Gospels," published a short time previously. It was, however, satisfactorily established by Mr Tytler, that the supposed plagiarism was in reality the result of coincidence of opinion. Of this the doctor became thoroughly satisfied, and a warm friendship grew up between the parties.] though it is probable that he did not make much progress until his professional duties directed his attention more forcibly to the same subject. His character as a country clergyman was established in a very short time. The amiable simplicity of his manners, the integrity and propriety of his behaviour, conjoined with his extensive knowledge, and the general esteem in which he was held by literary men, very soon brought him into notice. He was consequently induced to relinquish his charge in the country, and comply with the invitation of the magistrates of Aberdeen, and take charge of one of the quarters of that city. Here he derived great advantage from the society of literary men, and the opportunity of consulting public libraries. Mr Campbell joined the Literary Society of Aberdeen, which had been formed in the year 1758, and which comprehended many men afterwards eminent in literature and philosophy. The subjects discussed in this association were not confined to those coming strictly within the category of the belles lettres; all the different branches of philosophy were included in its comprehensive range. Campbell took a very active part in the business of the society, and delivered in it the greater part of his "Philosophy of Rhetoric." Principal Pollock of Marischal College died in 1759, and it was supposed at the time that the chance of succeeding him was confined to two gentlemen possessed of all the local influence which in such cases generally insures success. Mr Campbell, who was ambitious of obtaining the situation, resolved to lay his pretensions before the duke of Argyle, who, for many years, had dispensed the government patronage of Scotland. It happened that one of Mr Campbell’s ancestors, his grandfather or great-grandfather, had held the basket into which the marquis of Argyle’s head fell when he was beheaded. Mr Campbell hinted at this in the letter he addressed to his grace; and the result was his appointment to the vacant place. This anecdote, we need scarcely remind the reader, has been lately used in fictitious history. Shortly after this Mr Campbell received the degree of doctor of divinity from King’s College, Aberdeen; and, in 1763, he published his celebrated "Treatise on Miracles," in answer to what was advanced on that subject by David Hume; a work which has been justly characterised as one of the most acute and convincing treatises that has ever appeared upon the subject. Mr Hume argues, "That experience, which, in some things is variable, in others uniform, is our only guide in reasoning concerning matters of fact. A variable experience gives rise to probability only; a uniform experience amounts to a proof: Our belief of any fact from the testimony of eye-witnesses is derived from no other principle than our experience in the veracity of human testimony. If the fact attested be miraculous, here arises a contest of two opposite experiences, or proof against proof. Now, a miracle is a violation of the laws of nature; and as a firm and unalterable experience has established these laws, the proof against a miracle, from the very nature of the fact, is as complete as any argument from experience can possibly be imagined; and, if so, it is an undeniable consequence, that it cannot be surmounted by any proof whatever derived from human testimony. Dr Campbell, in his answer, aims at showing the fallacy of Mr Hume’s argument by another single position. He argues, "That the evidence arising from human testimony is not solely derived from experience; on the contrary, testimony hath a natural influence on belief, antecedent to experience. The early and unlimited assent given to testimony by children gradually contracts as they advance in life: it is, therefore, more consonant to truth, to say, that our djffidence in testimony is the result of experience, than that our faith in it has this foundation. Besides, the uniformity of experience, in favour of any fact, is not a proof against its being reversed in a particular instance. The evidence arising from the single testimony of a man of known veracity will go far to establish a belief in its being actually reversed: If his testimony be confirmed by a few others of the same character, we cannot withhold our assent to the truth of it. Now, though the operations of nature are governed by uniform laws, and though we have not the testimony of our senses in favour of any violation of them, still, if, in particular instances, we have the testimony of thousands of our fellow-creatures, and those, too, men of strict integrity, swayed by no motives of ambition or interest, and governed by the principles of common sense, that they were actual eye-witnesses of these violations, the constitution of our nature obliges us to believe them." Dr Campbell’s essay was speedily translated into the French, Dutch, and German languages. The activity and application of Dr Campbell received an impulse in 1771, from his being appointed professor of divinity in Marischal college, in place of Dr Alexander Gerard, who had removed to the corresponding chair in King’s. These two eminent men had been colleagues, and preached alternately in the same church. They were now pitted against each other in a higher walk, and there can be no doubt, that, as the same students attended both, a considerable degree of emulation was excited betwixt them. Gerard was perfectly sensible of the talents of his new rival. His friends had taken the freedom of hinting to him that he had now some reason to look to his laurels; in answer to which he remarked carelessly, that Dr Campbell was indolent. An unfortunate misunderstanding had existed between these two excellent men for many years: it was now widened by the report of Gerard’s trivial remark, which some busy person carried to Dr Campbell’s ears, probably in an exaggerated shape. This circumstance is said, however, to have had the beneficial effect of stimulating Dr Campbell’s exertions. The manner in which he discharged his duties was most exemplary; and the specimens which he has given in his preliminary Dissertations to the Translation of the Gospels, in his Lectures on Ecclesiastical History, and on Theology, afford abundant proofs of his high qualifications as a public lecturer. It will be at the same time observed, from the list of his works, immediately to be submitted, that the vacations of his professional labours were most sedulously employed for the advantage of the public and posterity. Dr Campbell appears to us to have been one of the most splendidly gifted men that appeared during the course of the last century. His body was remarkably feeble; his stature greatly below that of ordinary men in this country. His health was extremely delicate, and required for the long period of three-score years and ten the utmost care and attention. Yet his powers of application were above those of most men, and, what is strange, were exemplified chiefly in his later and feebler years. He was a man of the utmost simplicity of manners and naivete of character, and remarkably pleasant in conversation. The works which he has published prove, in the most indisputable manner, that he was possessed of true philosophical genius. His powers of abstraction appear to have been greater than those of most men of ancient or modern times. The study of languages was employed by him to the best advantage; and the accuracy of his disquisitions throws a light upon the nature of the human mind, while it discovers a habit of attention to the actings of his own mind, which has certainly not been surpassed by any of those who have cultivated the science of morals.